WorldStage provided AV support for Intel's annual internal sales and marketing conference, i-360, held in San Diego Convention Center. i-360 featured four keynotes, which were presented on a multi-level set designed by JHA with an array of slightly curved display surfaces. Elevated front-projection screens, for speaker support and demos, included a 92x20-foot center screen flanked by 35.5x20-foot side screens and separated by lighting panels. Upstage of them and also spanning the stage was an assortment of display surfaces, which acted as a scenic backdrop with the speaker entrance at the center. The upstage surfaces included rear-projection screens and 9mm lightweight LED video displays separated by lighting panels. A tiny Marshall HD spy camera was installed inside Intel's 20-foot tall MegaBot robot, which made a startling t-shirt spewing kickoff for one of the keynotes. The camera was mounted inside the control cockpit to offer the robot's POV to the audience. The last keynote revealed a Uniview LED floor installed in a recess of the stage floor by WorldStage. 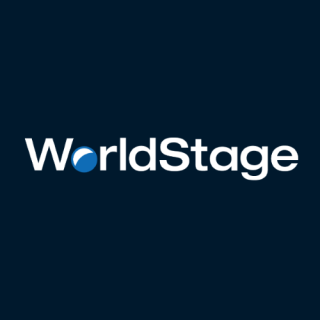 "We put it in overnight during set installation so we didn't interrupt the flow of set building," said James Sarro, WorldStage account and project manager. "The LED floor was concealed by carpeting, which was removed for the concluding presentation." The cameras mounted over the stage captured views of the LED floor's dynamic graphics for those sitting too close to the stage to see it.